Tanya Billing, a courageous 17-year old, fought Adult Acute Myeloid Leukaemia with courage and determination. In the last 20 months of her short life, she expressed the wish to help others. Tanya's Courage Trust aims to do just that. As a charity offering financial help and support to young people fighting Cancer aged 16 to 25 in Cornwall, Isles of Scilly and Devon, we'll do our best to help you through the tough times. If there's anything you and your family need, let us know. It could be a special day out, a nice meal, or perhaps some new games to ease the boredom. Our Penryn Shop Inspired by Sasha Watson. Our Penryn shop is inspired by Sasha Watson, diagnosed with a very rare form of Liver Cancer, Fibromellar in 2013, just 3 days before her 17th birthday. Sasha, full of love, life and laughter, didn't let cancer define her as a person. Her courage, bravery and determination was both humbling and inspiring. 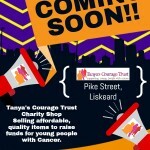 Our Penryn shop is for us in her memory, to raise money and awareness for the charity to support Young people with Cancer in Cornwall and Devon. We are always looking for new volunteers to join our team, we have many opportunities within the charity, from retail to admin. 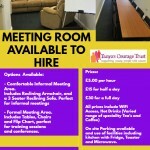 If you are interested in joining our team please contact us on 01726 65364 (St Austell) or 01326 375941 (Penryn).